United Nations, N.Y. Vesak – “Buddha’s Birthday” – is the most sacred day in the Buddhist calendar, which celebrates the birth, enlightenment and the Parinirvãna (passing away) of Gautama the Buddha. A rough approximation to Christmas for Christians. In an era where the world is darkened by multiple conflicts and natural and man-made calamities, the Buddha’s message of non-violence, understanding, compassion and peace, is powerfully relevant. 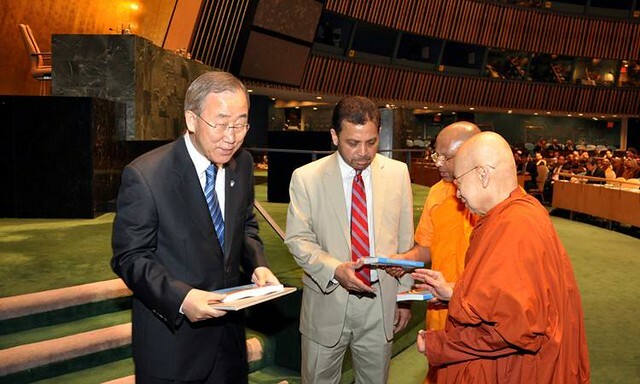 The United Nations will celebrate the International Day of Vesak tonight – May 7, 2012 at the U.N. General Assembly Hall. The event will start at 6.30 p.m. I am pleased to address you on this very meaningful international recognition of Vesak Day, to mark the birth, enlightenment and passing of the Buddha. Millions of people around the world have been inspired by the Buddha’s life and teachings. I am one of them. My own mother is a devout Buddhist. She has been praying for me and my family and for peace and prosperity in the world. Maybe that is why I was so moved last year when I visited Nepal and saw the stone at Lumbini marking the Buddha’s birthplace.I was impressed by the monuments and monasteries. I will always remember the kindness of the monks at the Mayadevi Temple. As I walked through the sacred area, I thought about the life journey of this extraordinary individual, who transformed himself from a sheltered prince to the founder of one of the world’s great religions. He was rich. He could have lived a carefree existence. But he was troubled by the suffering of others, so much so that he left behind the comforts of his palace to help others overcome the painful realities of life. All of us can learn from the Buddha’s spirit of compassion. His timeless teachings can help us to navigate the many global problems we face today. The financial crisis, climate change crisis, pandemics, terrorism and other international threats prove that the fates of all people are interlinked. A problem in one country can quickly turn into a worldwide threat. I constantly remind leaders that we must act together or we will fail individually. I tell them that we must join forces in solidarity. Not only is this the right thing to do; it is in our best interests. These teachings offer wisdom for our times, too. Now it falls to each of us, wherever we are and whatever we do, to carry on this spirit. As we celebrate this Day of Vesak, let us resolve to help people who are suffering so that we may secure a better life for all. On Vesākha day, devout Buddhists and followers alike are expected and requested to assemble in their various temples before dawn for the ceremonial, and honorable, hoisting of the Buddhist flag and the singing of hymns in praise of the holy triple gem: The Buddha, The Dharma (his teachings), and The Sangha (his disciples). Devotees may bring simple offerings of flowers, candles and joss-sticks to lay at the feet of their teacher.These symbolic offerings are to remind followers that just as the beautiful flowers would wither away after a short while and the candles and joss-sticks would soon burn out, so too is life subject to decay and destruction. Devotees are enjoined to make a special effort to refrain from killing of any kind. They are encouraged to partake of vegetarian food for the day. In some countries, notably Sri Lanka, two days are set aside for the celebration of Vesākha and all liquor shops and slaughter houses are closed by government decree during the two days. Also birds, insects and animals are released by the thousands in what is known as a ‘symbolic act to liberation;’ of giving freedom to those who are in captivity, imprisoned, or tortured against their will. Some devout Buddhists will wear a simple white dress and spend the whole day in temples with renewed determination to observe the eight Precepts. The Visākha is Pali which means the sixth month and is Vaiśākha in Sanskrit. People in Thailand call it in Pali. Visākha Puja means the worship in the sixth lunar month. However, people in Sri Lanka call it Vesak including the United Nations that adopted it as an International Day and use Vesak as well, so Vesak has become the word in English. The U.N.’s GA Resolution 54/115 of 2000 formally recognized the International Day of Vesak. Now, the International Day of Vesak is commemorated annually at the United Nations Headquarters and its worldwide offices. The unique feature being that each year a different Permanent Mission to the United Nations hosts the event. The celebrations will include cultural activities, supported by a number of Buddhist and non-Buddhist countries. 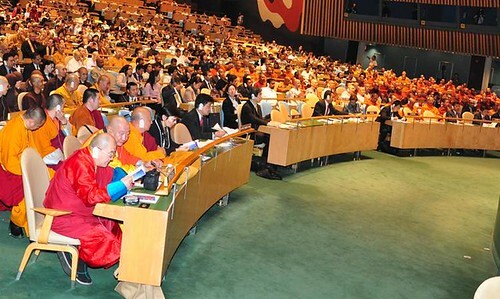 Celebrating the Buddhist International Day of Vesak in the U.N. General Assembly. This year, Vesak Day will be commemorated with a series of events organized by the Permanent Mission of Sri Lanka to the United Nations in New York with the generous assistance of other missions. The heads of the United Nations bodies along with other senior officials of the UN system are expected to attend this occasion. Permanent Representatives of Member States will also attend the event and a number of them will address the gathering. 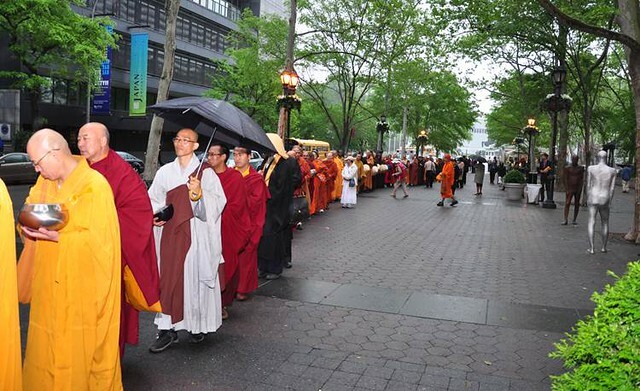 A large number of Buddhist monks from around the world are expected to attend, along with religious dignitaries from other major religions. The holy day of Vesak is observed traditionally by Buddhists in Bangladesh, India, Nepal, Sri Lanka, and the South East Asian countries of Singapore, Vietnam, Thailand, Cambodia, Laos, Malaysia, Burma, and Indonesia. Interestingly, the decision to agree to celebrate the Vesākha as the Buddha’s birthday was formalized at the first Conference of the World Fellowship of Buddhists held in Sri Lanka in 1950, although festivals at this time in the Buddhist world are a centuries-old tradition. Following the special commemorative event in the General Assembly Hall, cultural performances will be held at the Visitor’s Lobby, depicting the rich Buddhist heritage of the organizing Member States. The day will conclude with a food festival hosted by the organizing Member States, representing delicacies from over 19 nations. The public is welcome to participate in all above events. Further details can be obtained from the Permanent Mission of Sri Lanka to the United Nations, New York (email). I am looking forward to it! #9: Can We Help Support Education and Orphan Care in Bihar, India? #15: Pilgrimage Postscript: Pneumonia and Possible T.B. John Laing is a writer based in New York with decades of non-profit experience.